I have never been one to make New Year’s resolutions. Actually, that’s not true. I almost always make promises to eat healthier, drink less wine, and workout more, but I don’t usually write those resolutions down since I know there’s a (very) high degree of probability I won’t follow through with any of them for more than a couple of months. I just feel like life should be spent LIVING, and while I enjoy leading a healthy lifestyle as much as I can, I simply cannot exist on kale salads and cucumber water, you know? So rather than trying to turn myself into someone I’m not this year, I’m going to concentrate on becoming a better version of the person I already am. I feel like I’m old enough to embrace all of my imperfections, and while I still have moments when I wish I was born looking like a supermodel, being the mom of an impressionable 4-year-old has taught me to stop yearning to be someone else, and to start focusing on the person I am instead. 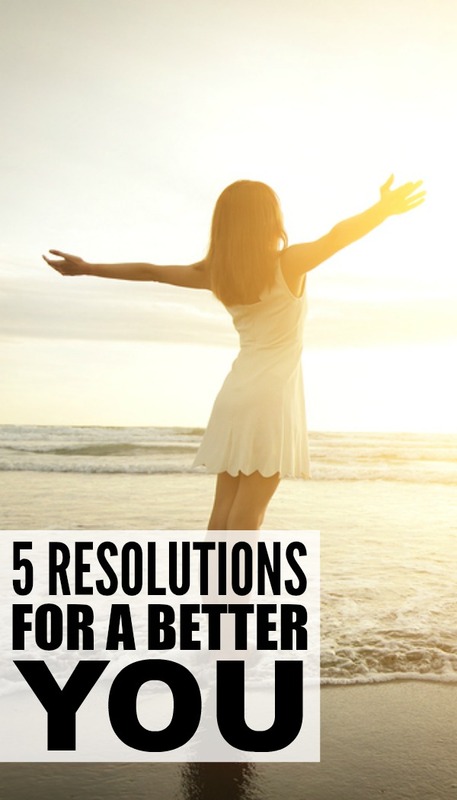 And since I know I’m not the only gal out there who is a better mom and wife when she looks and feels her best, I’m teaming up with the wonderful folks from goodnessknows to share 5 of my best New Year’s resolutions for a better you. For the last 4+ years, I have been surviving on 5-6 hours of sleep a night, and while I know it’s in my best interest to hit the sack early so I’m not so grumpy and tired when my daughter wakes up at the crack of dawn, I really struggle to get myself into bed before midnight each night. But when a trainer at my gym gave me a really hard time about my unhealthy sleep habits and explained all of the horrible effects sleep deprivation can have not only on my physical health, but also on my emotional well-being, I decided to heed her advice. I started by getting an additional 30 minutes of sleep, and was so amazed at what a difference it made that I’m now going to bed a full 2+ hours earlier each night. I find I’m less moody, more patient, my productive, and better able to handle stress, and cannot fathom how I used to function on such little sleep! A research group conducted a study in which they assessed feelings of fatigue in 2 groups of people. Both groups got the same amount of rest and exerted the same amount of energy throughout the study, but the Test Group was led to believe they were more well-rested than they really were. The result was that everyone (or nearly everyone) in the Test Group reported lower feelings of fatigue and higher levels of alertness compared to those in the Control Group, which led the researchers to believe that our PERCEPTION of how tired we are plays a huge role in how we actually feel on a daily basis. I had all but forgotten about that study, but when I found myself unable to shake a bad mood earlier this week, I was pleasantly surprised that by changing my perception of the situation that was making me grumpy, and focusing on all of the GOOG THINGS in my life that make me happy, I was able to lift myself out of my funk. While my New Year’s resolutions have often consisted of promises to spend more time at the gym, I’m trying a new approach this year. Rather than setting unrealistic goals to get in 3 spin classes, 2 runs, and a couple of weight classes each week, I’ve decided to take the advice of a trainer at my gym and focus on doing the exercises I enjoy instead. Her rationale is that if we make our workouts ‘fun’, they will be less of a chore and we will be more likely to make them a regular part of our routine. So rather than sticking to a gruelling schedule that will inevitably set me up for failure, I have simply made a commitment to get in at least 4 good workouts each week, and I decide in the moment what that workout will consist of. I had actually intended on doing a spin class today, but while I was lacing up my runners, I made a spur-of-the-moment decision to hit the treadmill instead, and ran 10K in less than 55 minutes! If I could change one thing about myself, it would be to stop worrying about the future. I find I spend so much time agonizing about what MIGHT happen tomorrow, next week, or next year that I often forget to enjoy what’s happening right in front of me. And while I derive some comfort from anticipating what COULD happen so I can be prepared, experience has proven that it’s extremely exhausting and unproductive to worry about the things I cannot control. So rather than obsessing about the future, or dwelling on the past, I’ve been making a conscious effort to live in the moment, and my new mindset has made me a much better wife and mother. 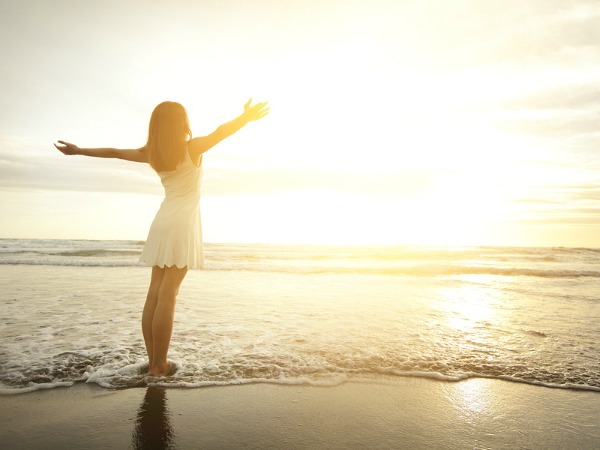 It took some practice and getting used to, but by focusing on the here and now, I find I am much better equipped to give 100% of myself to those I love, and I am a much happier person as a result. While I cannot make promises to eat healthy 100% of the time, age and experience have taught me that the foods I consume have a direct impact on my mood and overall sense of well-being. For the most part, this keeps me extremely dedicated when it comes to maintaining a diet filled with fruits, vegetables, and lean proteins, but if I’ve learned anything in the last 38 years of my life, it’s the importance of indulging once in a while. In the past, indulgences used to come in the form of cookies, cakes, and pies, and while I still appreciate those things every once in a while, I am more interested in finding healthy snacks I can enjoy on the regular that will satisfy my cravings without pumping me full of empty calories. 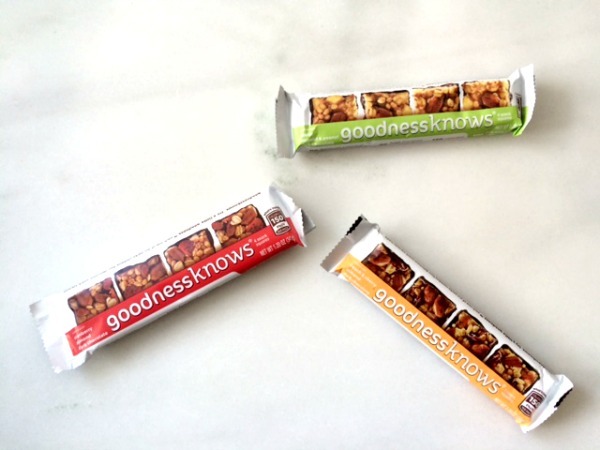 Which is why I love goodnessknows snack squares. Have you ever heard of these gems? 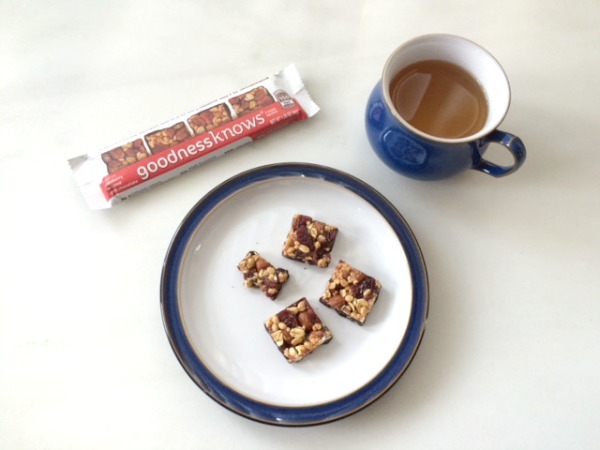 Cranberry, almond, dark chocolate: Packed with roasted almonds and toasted rolled oats with a hint of natural sweetness, this combination leaves you feeling happily satisfied. Apple, almond & peanut, dark chocolate: Crunchy peanuts, toasted almonds and tangy apples are the perfect combination for snack time, a treat post-meal or during your favorite indoor or outdoor activity. Peach & cherry, almond, dark chocolate: Sweet peaches and cherries accompanied by wholesome toasted almonds and dark chocolate to create a satisfying crunch. The cranberry, almond, and dark chocolate squares are my favorite, and with 3 grams of protein and less than 200 calories per serving, they make the perfect mid-afternoon snack to satisfy my chocolate cravings while also keeping my hunger pangs at bay until dinnertime. Want more tips for making (and keeping!) healthier food and fitness resolutions this year? Check out this awesome infographic! And if you found these New Year’s Resolutions for a Better You helpful, please share them on Pinterest!